Built on the shoulders of the sturdy Moa and improving on its durability and range, the Eagle is the next generation in Caldari gunboats. Able to fire accurately and do tremendous damage at ranges considered extreme by any cruiser pilot, this powerhouse will be the bane of anyone careless enough to think himself out of its range. 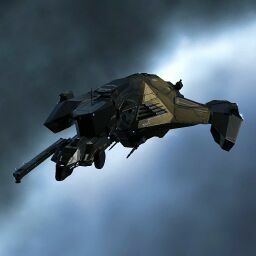 Caldari starship design is showing a growing trend towards armaments effective at high ranges, and in this arena, as in others, Ishukone do not let themselves get left behind; the Eagle was intended by them as a counter to the fearsome long-range capabilities of Lai Dai's Cerberus ship. The big brother of the Harpy. Its optimal range bonuses stack multiplicatively for a maximum 125% increase in optimal range. With the innate long range of rail guns this gives the eagle a range that sniper battleships can be proud of. Unfortunately the Eagle is rather specialised and doesn't perform very well in any other role than sniper, making it unpopular overall. Further information about additional or recommended skills to pilot Eagle for a specific or it's common role(s) can be written here. No sub-article about Eagle roles or piloting tactics. You can write them here. You can write additional notes for Eagle here. The Eagle now has a 25 m3, 25 Mbit/s drone bay. Onyx and Eagle ship models have been redesigned so that they and the Moa no longer look so much the same. Role Bonus: 50% reduction in MicroWarpdrive signature radius penalty. 4% bonus to shield resistances. Slot layout: 5H(-1), 6M(+1), 4L; 5 turrets, 2 launchers. Fittings: 990 PWG(+115), 440 CPU(+2). Defense (shields / armor / hull) : 2500(+391) / 1250(-16) / 1550(+3). Capacitor (amount / recharge rate / cap/s) : 1350(-25) / 255s (-80s) / 5.29/s (+1.2). Mobility (max velocity / agility / mass / align time): 180(+16) / .576 / 11720000 / 9.36s. Drones (bandwidth / bay): 0 / 0. Targeting (max targeting range / Scan Resolution / Max Locked targets): 90km(+20km) / 252 / 8. This page was last modified on 21 March 2018, at 00:33. This page has been accessed 77,918 times.